This Speak & Spell (English Voice) model introduced in 1986 got a slightly changed keyboard design. View the previous design here. The pictured Speak & Spell (English voices) was manufactured in 1991 and represents the last design iteration of the Speak & Spell family. The printed circuit board (PCB) itself is much smaller than the original Speak & Spell design but sports an almost identical design. Microcontoller: The microcontroller is derived from the TMS1000 series and adopted to control both the keyboard, the display and to feed the speech synthesizer. This Speak & Spell uses a TMC0271 which interprets as TMC0270, ROM-Code 1. Speech Synthesizer: The Speak & Spell series uses with the TMC 0280 the first one-chip LPC speech synthesizer. Later refinements to the Speak & Spell chips resulted in the TMS 5100, 5200 and 5220 Voice Synthesis Processors for commercial products. 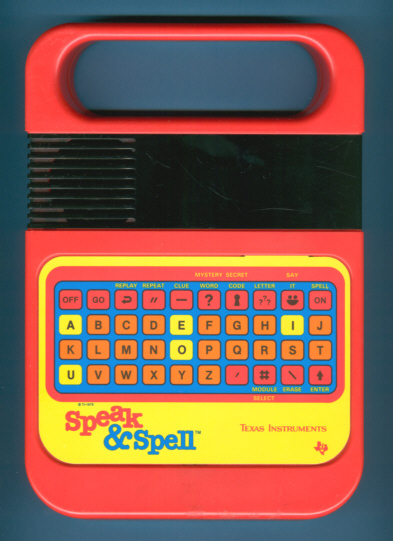 This Speak & Spell uses a CD2801 which interprets as TMC0280, Version 1. Speech ROM: Speech data is stored in a 128k ROM chip with the designation TMC 0350. This Speak & Spell uses a CD62175 which is actually a double VSM (Voice Speech Memory) with 256k capacity. In 1986 we knew a total of 10 different plug-in modules for the Speak & Spell, a comprehensive overview including the wordlists could be found here. © Joerg Woerner, December 3, 2007. No reprints without written permission.